Gneiss: The specimen shown is about two inches (five centimeters) across. It is easy to see the "salt and pepper" banding of this rock. 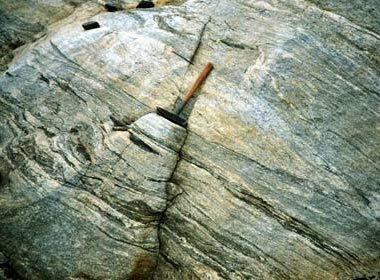 Gneiss is a foliated metamorphic rock identified by its bands and lenses of varying composition, while other bands contain granular minerals with an interlocking texture. Other bands contain platy or elongate minerals with evidence of preferred orientation. It is this banded appearance and texture - rather than composition - that define a gneiss. Gneissic Granodiorite: An outcrop of gneissic granodiorite in the Zarembo Island area of southeastern Alaska. Gneiss usually forms by regional metamorphism at convergent plate boundaries. It is a high-grade metamorphic rock in which mineral grains recrystallized under intense heat and pressure. This alteration increased the size of the mineral grains and segregated them into bands, a transformation which made the rock and its minerals more stable in their metamorphic environment. Gneiss can form in several different ways. The most common path begins with shale, which is a sedimentary rock. Regional metamorphism can transform shale into slate, then phyllite, then schist, and finally into gneiss. During this transformation, clay particles in shale transform into micas and increase in size. Finally, the platy micas begin to recrystallize into granular minerals. The appearance of granular minerals is what marks the transition into gneiss. Intense heat and pressure can also metamorphose granite into a banded rock known as "granite gneiss." This transformation is usually more of a structural change than a mineralogical transformation. Granite gneiss can also form through the metamorphism of sedimentary rocks. The end product of their metamorphism is a banded rock with a mineralogical composition like granite. 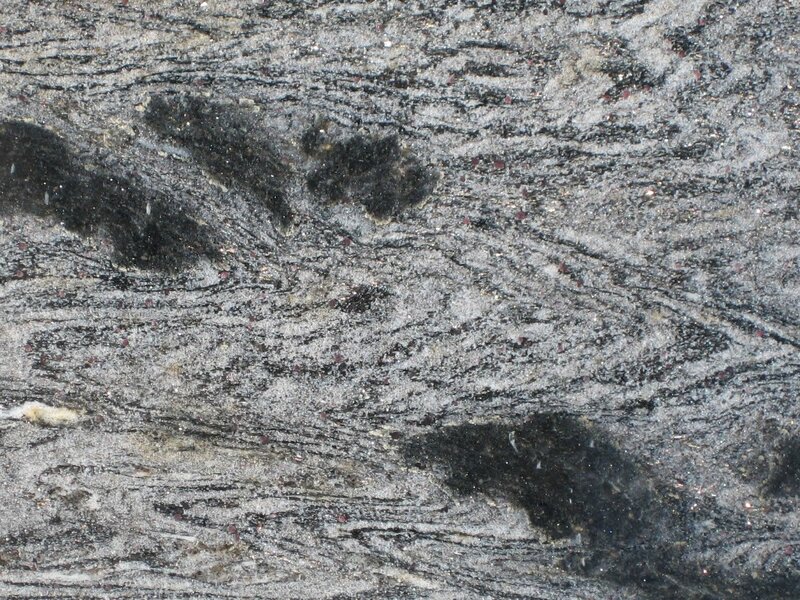 Folded Gneiss: A photograph of polished gneiss from the stock of a countertop vendor. The view shown in the photo is about 12 inches across. Click to enlarge. Although gneiss is not defined by its composition, most specimens have bands of feldspar and quartz grains in an interlocking texture. These bands are usually light in color and alternate with bands of darker-colored minerals with platy or elongate habits. The dark minerals sometimes exhibit an orientation determined by the pressures of metamorphism. 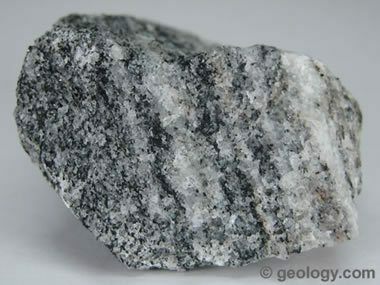 Some specimens of gneiss contain distinctive minerals characteristic of the metamorphic environment. These minerals might include biotite, cordierite, sillimanite, kyanite, staurolite, andalusite, and garnet. Gneiss is sometimes named for these minerals, examples of which include "garnet gneiss" and "biotite gneiss." Garnet Gneiss: A coarse-grained gneiss composed mainly of hornblende (black), plagioclase (white), and garnet (red) from Norway. Public domain photo by Woudloper. 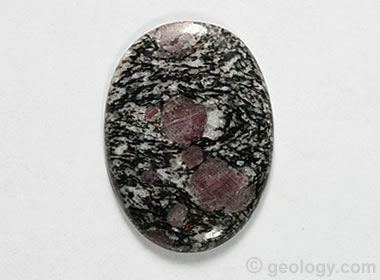 Garnet Gneiss: A cabochon cut and polished from garnet gneiss. A cabochon cut from this type of material is rarely seen, but it would be an interesting gem for a geologist. The stone is approximately 38 x 27 millimeters in size. 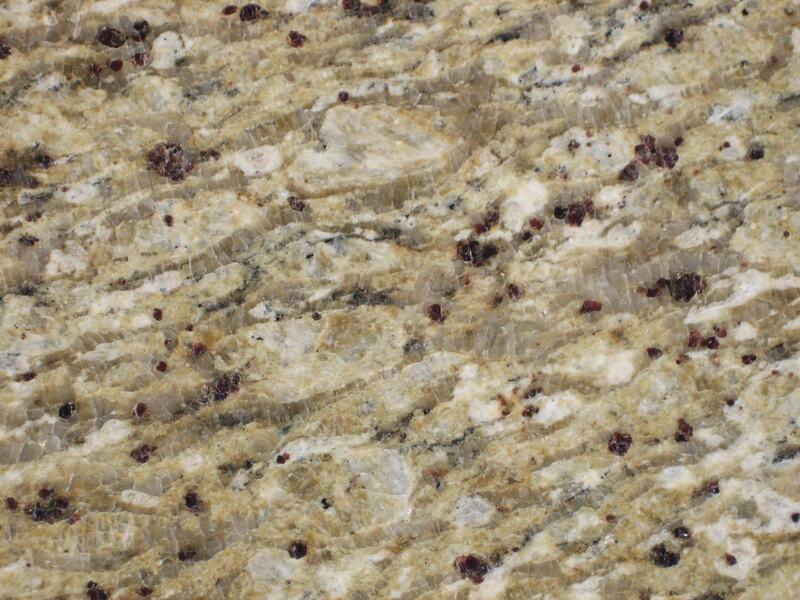 Garnet Gneiss: A photograph of polished garnet gneiss from the stock of a countertop vendor. The view shown in the photo is about 12 inches across. Click to enlarge. Gneiss usually does not split along planes of weakness like most other metamorphic rocks. This allows contractors to use gneiss as a crushed stone in road construction, building site preparation, and landscaping projects. Some gneiss is durable enough to perform well as a dimension stone. These rocks are sawn or sheared into blocks and slabs used in a variety of building, paving, and curbing projects. Some gneiss accepts a bright polish and is attractive enough for use as an architectural stone. Beautiful floor tiles, facing stone, stair treads, window sills, countertops, and cemetery monuments are often made from polished gneiss. Corundum Gneiss: This is a specimen of corundum gneiss from Gallatin Valley, Montana. This specimen is about four inches across and has a round blue sapphire crystal on the left side. Don't be surprised if you see gneiss labeled as "granite" at a cabinet shop or monument company. In the dimension stone trade, any rock with visible, interlocking grains of feldspar is considered to be "granite" in that industry. Seeing gneiss, gabbro, labradorite, diorite, and other types of rock marketed as "granite" disturbs many geologists. However, this long-time practice of the dimension stone trade simplifies discussions with customers since not everyone knows the technical names of unusual igneous and metamorphic rocks. 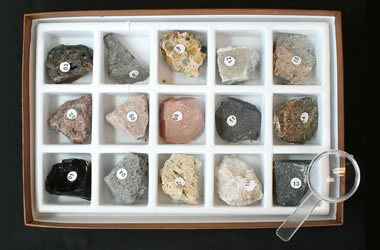 Small rock and mineral specimens about one inch in size are usually adequate for student examination and identification. However, many rock units, identified as gneiss in the field, have bands that are thicker than one inch. If samples of these rock units are broken into one-inch pieces, many of them will be too small to exhibit the banding features of gneiss. This will confuse many students and cause others to incorrectly identify the rock. Teachers can avoid these problems by collecting specimens that clearly display a banded structure. Teachers who purchase specimens must examine them carefully before they are presented to students. After students have learned to identify gneiss and many other rock types, presenting specimens of gneiss that do not exhibit banding can be a challenging way to have students: A) consider possibilities that are not obvious, and, B) realize that a single rock specimen may not adequately represent a rock unit.